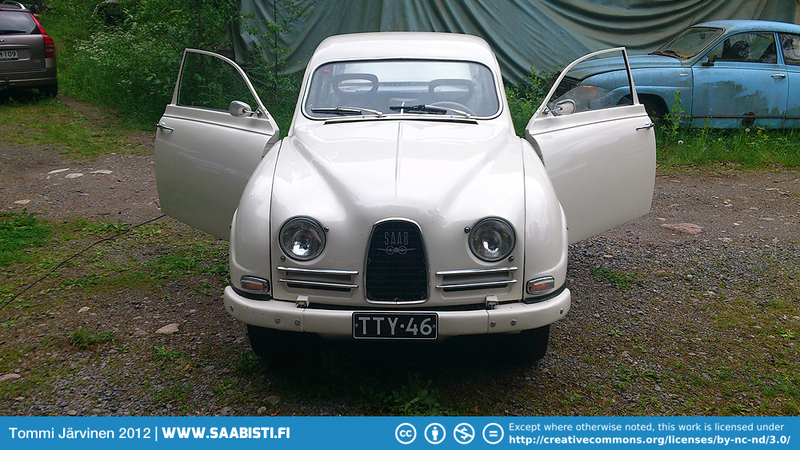 I have had this two-stroke 1964 Saab 96 Sedan for several years and been restoring it on and off. 850 cc 3-cylinder engine with triple carburetors from a 1966 “longnose” Saab 96. Electric fan and fuel pump. Alternator instead of the original generator. Clutch housing and driveshafts are of the later “hand grenade / potato masher” type, which makes it possible to install front disc brakes. At the moment the car has 1966 type drum brakes. A significant amount of corrosion repairs has been done also. Original colour was “Midnight Blue” but has been changed to “Polar White” from the Saab 9-5 color book. Part 69. Various pieces painted. Part 23. 1965 engine test run! I am considering to “overfill” the gearbox on my two stroke 96 MY 1965 (4 speed) with Castrol EP90. This means 2 liters of oil as recommended by Niklas in his XP Manual. I wondered if you have tried to do so, and what experiences you have made? But if you try it let me know if there’s any difference. My mother is trying to sell my grandmothers 64 Saab needs restored and I don’t know how much it’s worth or where to start looking. Any help would be appreciated. the price depends a lot on condition. Could you send me a couple of photos to take a look at? Also the location matters, as the cars are rarer in some countries than others. I am having difficulty in finding a gas tank for a 1962 bull nose saab. I have found two tanks, but they are damaged. Are there any universal tanks that can be use. I am putting my first car back on the road- ’64 96. Going thru brakes and got gas tank cleaned and repaired. Here is a question- what is the little brass knurled knob that sticks out of the passenger side corner of the heater core box? My book doesn’t mention it. Thanks John from Maine. Nice to hear you are putting a two-stroke back on the road. The knob is a valve used to let air out of the cooling/heater system. When you put in fresh cooling fluid start the car and keep the valve open until a steady stream of fluid comes out, then close it. Thanks for that info! I have never touched it in 30 years. Do you know of a pattern on-line someplace for making the small mud flaps that go in front of the rear wheels? A simple thing to make but it would save time if I had a pattern ready-to-go. Thanks! I have 4 NOS Bosch distributor caps (part number 1 235 522 055) for SAAB 3 cylinder 2 stroke engines. Would you be interested? Do you know of anyone who might need them? I have just acquired a ’61 SAAB 96 down here in Cape Town , South Africa where there are very few strokers (if any), and struggling to source parts. The car arrived with a broken dizzy cap , so would be keen to purchase a new item, if you still have them? Hello Tommy, Still working on my ’64. I have had my gas tank repaired and no leaks. It was silver-soldered on the filler end. The problem now is that there is restriction in the fuel pipe inside the tank. I tried running some stiff steel wire in there but it bottoms out. What is inside the tank? Is there a screen at the end of the intake? Is there an easy way to open it up so it flows better? It’s from a two-stroke tank but I think the V4 fuel intake has a similar box around the ending of the fuel line. Usually old oil and gas in the two-stroke cloggs up the small holes. Can happen in V4 also. I don’t think there’s a really good method of clearing the holes without cutting the tank open. Some have removed the fuel sender and scraped the holes somewhat clean with a stiff wire. You could try some solvent / paint thinner also. And compressed air in reverse direction. Maybe someone offers a service to wash / clean the insides of the tank? If you come up with good solution to this, please let me know. Im owner of a Saab 96 two stroke and I need to sell it. In general, this car needs restoration and if someone enthusiastic in this class of car is interested please contact to me. The car is located in Lima, Peru and I can send it anywhere of the world with aditional engine of spare.